Spend a few moments in the halls of Archbishop Williams High School and you will understand the familial connotation of our motto is more than just an exercise in semantics. Our teachers develop relationships with our students to help them meet our high academic standards. Our small size provides opportunities to pursue a host of interests outside of the classroom—from the athletic field to the stage. Our Catholic mission embraces all who enter, from our new seventh and eighth graders to fifty-year alumni. 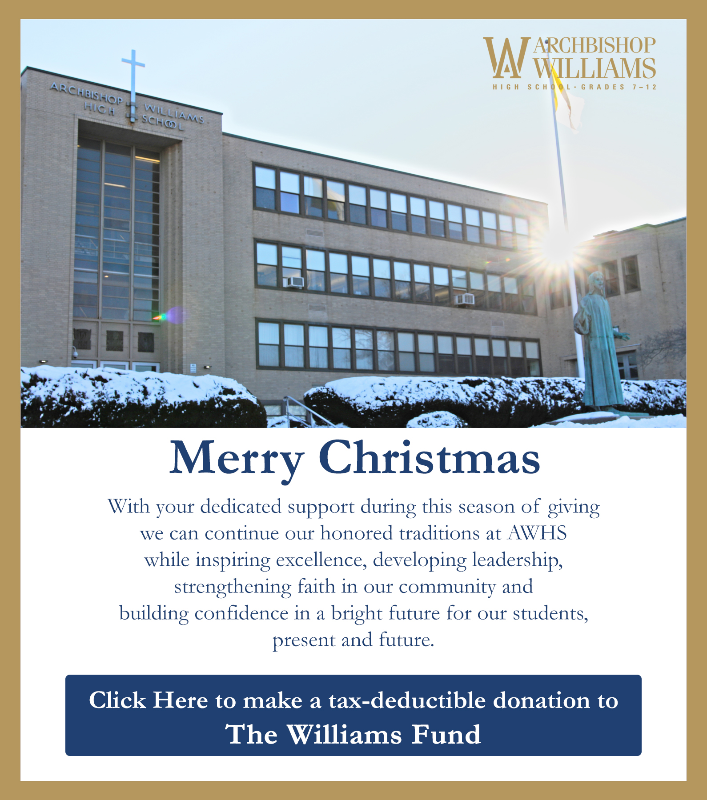 As the principal of Archbishop Williams, it is my privilege to vouchsafe our proud tradition, and invite you to examine all this institution has to offer. I have been blessed to earn three college degrees, including a doctorate from The University of Texas at Austin and an AB from Harvard University. Nevertheless, when asked what accolade I’m most proud, I state “none of the above.” I’m most proud of my diploma from Regis High School, a Jesuit school in New York City. Without the life (and Latin) lessons from those hallowed halls, I would not have had the honor to write this message. My pledge is for the sons and daughters of Archbishop Williams to graduate with the same bonds of affection, and the same opportunities. They will leave these hallowed halls prepared to advance towards life’s enduring satisfactions secure in their faith, and confident in their abilities. Because it starts with the love of family. Welcome to Archbishop Williams High School, where caritas Christi urget nos.